1 In the classic movie Dr. Doolittle, the doctor is able to talk to animals because he has learned the many unique animal languages from his talking parrot. Scientists today, however, have encountered different results than the famed animal guru when they have tried to decipher animal communication. Animal communication is very different from human language; at one level it consists of simple gestures and body language, like a rabbit thumping his foot to warn of danger, and at the other, it is composed of complex styles of communicating that are beyond human perception, including long distance infrasonic communication among elephants and electrical courtship dances in eels. 2 Although we may never know if some animals have languages comparable to that of humans, it is certain that animals communicate. Most scientists believe that all animals, with the exception of maybe gorillas and dolphins, lack the ability to express abstract thoughts and ideas, and to use grammar—hallmarks of human language. But this doesn’t mean that animal communication is limited. Often times, animals communicate in ways in which humans are incapable. 3 One way that both animals and people communicate is by smell. In humans, the signals we receive from our sense of smell are mostly unconscious, but in bee hives, smell is much more vital to their society. The queen bees release pheromones that regulate the activity in the hive. 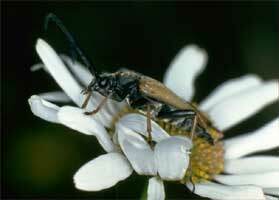 The most powerful of these is Queen Mandibular Pheromone (QMP). During the average 3-5 years of her life, she excretes QMP, essentially telling the hive that “we have a queen, all is well”. It is only when this pheromone disappears that worker bees feed larvae the royal jelly that transforms an ordinary larva into a new queen. 4 Like humans, most animals use body language to communicate. 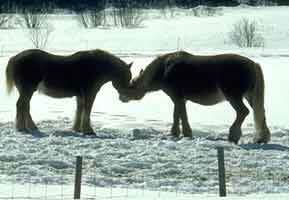 Horses show affection by rubbing noses; giraffes on the other hand, press their necks together to express the same idea. Because they are very social creatures, bees have a highly developed system of body language. For example, they perform a dance to tell others where to find food. In the dance a bee stands on a wall and turns from side to side. The length of the dance and the degree to which the bee turns indicate how far away the food source is and in what direction it is in relation to the sun. 5 Many animals use sound as a medium for communication as well. Some animals use sounds that are out of the range of human hearing (20-20,000 hertz). Elephants for example use low pitch sounds to communicate with other herds up to ten miles away. Dolphins and whales also use sound to communicate, singing elaborate songs that are an important part of their social networks. Dolphins, in general, have a higher pitch than humans and their average vocal range is about 18,000-23,000 hertz. One species of dolphins, the Bottlenose dolphin, can respond to tones within the frequency range of 1 to 150 khz with a peak sensitivity between 40 to 100 khz. 6 Although the methods of animal communication are often similar to that of humans, the form these communications take can exceed human limitations (for example, the elephant and dolphins whose voices can go below and above the human range of hearing, or the bees whose sense of smell is much more finely tuned). In some cases, however, animals boast a style of communication that humans completely lack. This is true of eels. Electric eels use pulsating electric fields to send information to other members of their species. Some species of eels divide their society into a hierarchy and communicate their position with their electrical frequencies. The most dominant eels have the most extreme frequencies so that they stand out (either high or low depending on the species). Eels use their fields in courtship rituals to attract their mates. Usually, dominant females mate only with dominant males. 7 On the other hand, some animals come close to mimicking human language. Parrots can mime the voice and speech of humans, while gorillas can learn many of the complexities of human sign language. One gorilla named Koko, combines signs to make new words and uses them routinely to ask for food and water or express her emotions. She is even able to understand human speech and to respond accordingly. Koko, it seems, is able to reach the level of speech a three or four-year-old might exhibit, with a limited sign-language vocabulary and some grammatical structure. 8 It seems that human language and grammar are unique to our species—something no other kind of animal has been able to completely understand or fully reproduce. Yet, animals have their own ways of communicating that we are often unable to even perceive. Each style is a wonder unto itself, full of sound, fury, and significance.